Feverish Fiction Magazine #5 is up for pre-order! Preorder Feverish Fiction Magazine #4! 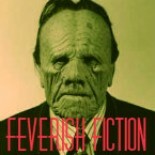 FEVERISH FICTION ISSUE #2 NOW AVAILABLE FOR PREORDER + TOC!